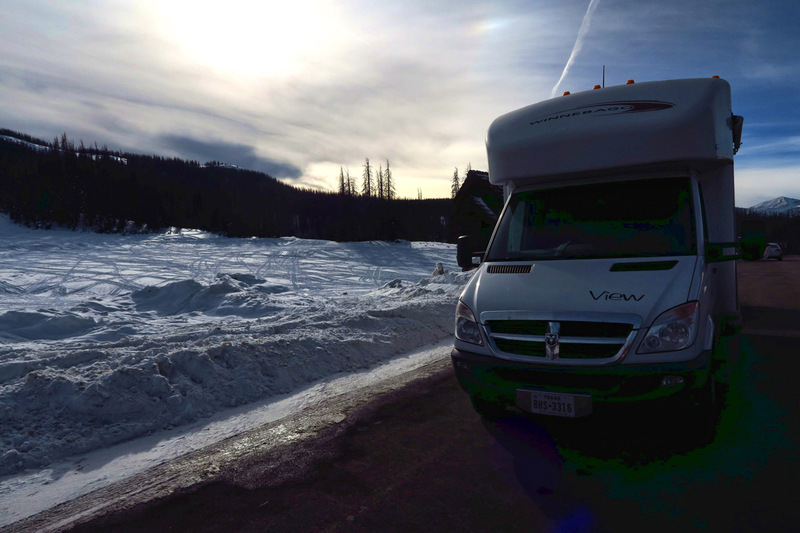 Wolf Creek Pass, just outside of Pagosa Springs. 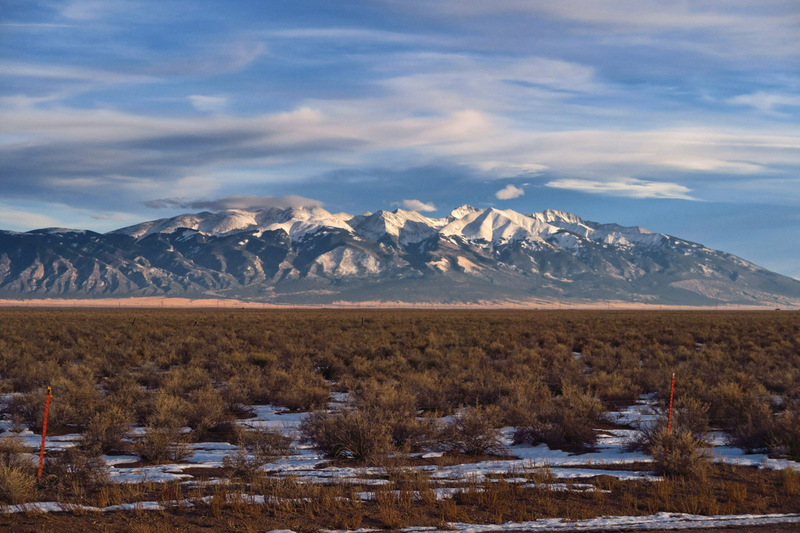 Beautiful Sangre de Cristos mountains. Sand dunes begin to appear on the approach via the long, lonely road. 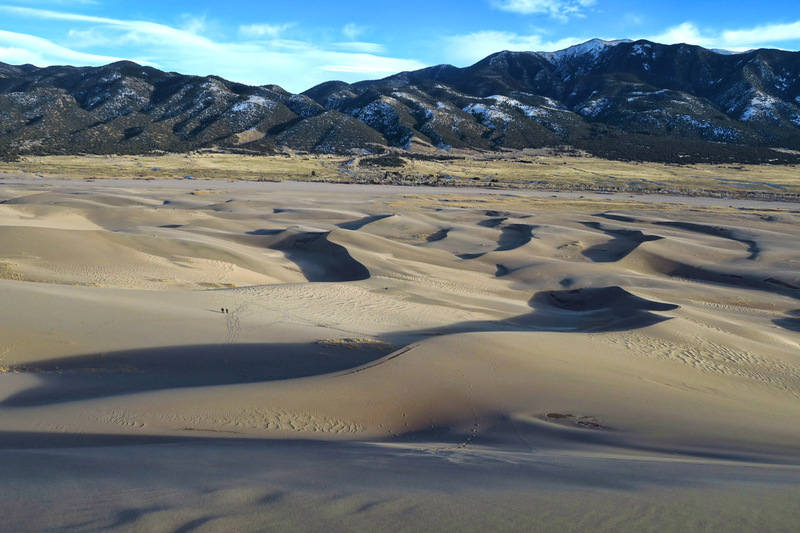 The Great Sand Dunes Visitor Center has a generous amount of long, level, enticing RV parking spaces, as does the large Dune Field parking area. I asked if I could stay there overnight, but was told no, there was not adequate personnel. I was told if I tried, a ranger would be along after midnight to extract me. But if there is sufficient personnel to run me out of the park, it’s hard to understand why a fully self-contained RV would be a problem. Or why a small loop of the campground couldn’t have been left open. Instead, the ranger at the Visitor Center suggested I use the turnouts outside the park boundary. 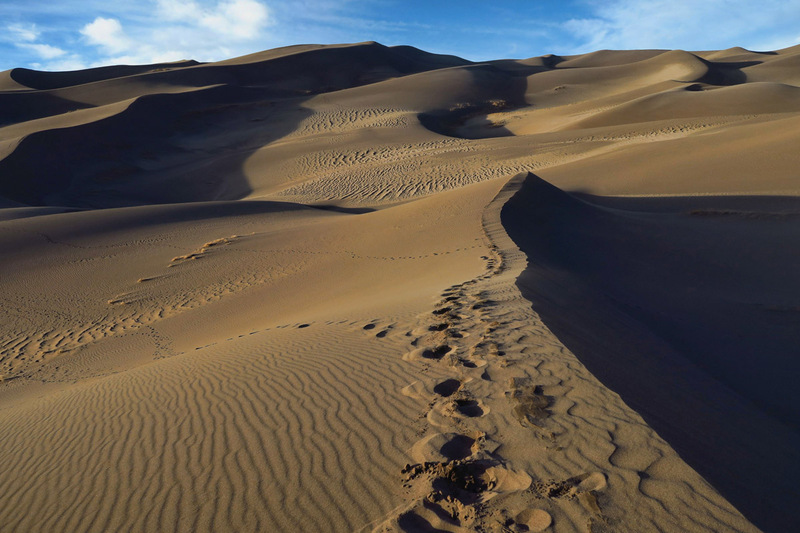 That was better than the answer I got from the monitor of the Department of the Interior Facebook page who suggested “backpacking in the dunes.” In 30 degree weather. Information boards at turnout explain the “sand sheet” which lies between the salt flats and dunefield. Entering the national park boundary, the dunes appear larger. Lassen Volcanic in northern California offers the perfect solution. 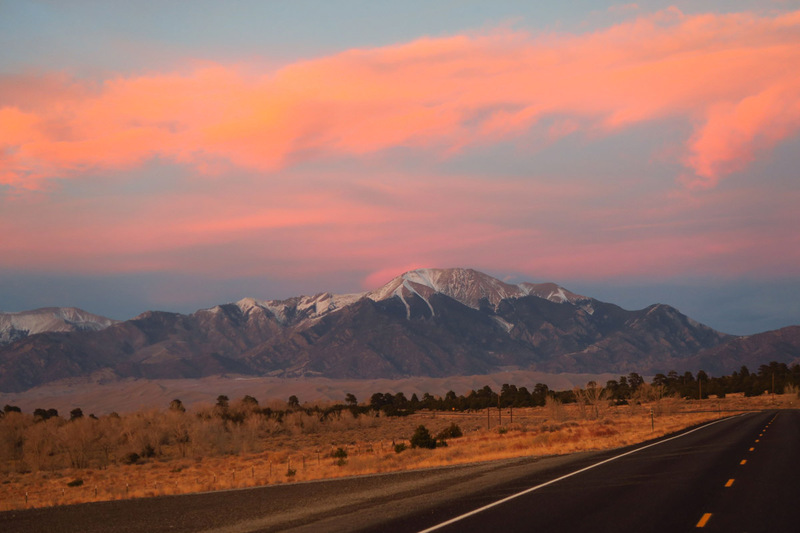 During the months that the campground is closed, they will allow fully self-contained vehicles to overnight in the Visitor Center parking lot for $10 per night. A “win-win” for everyone concerned. 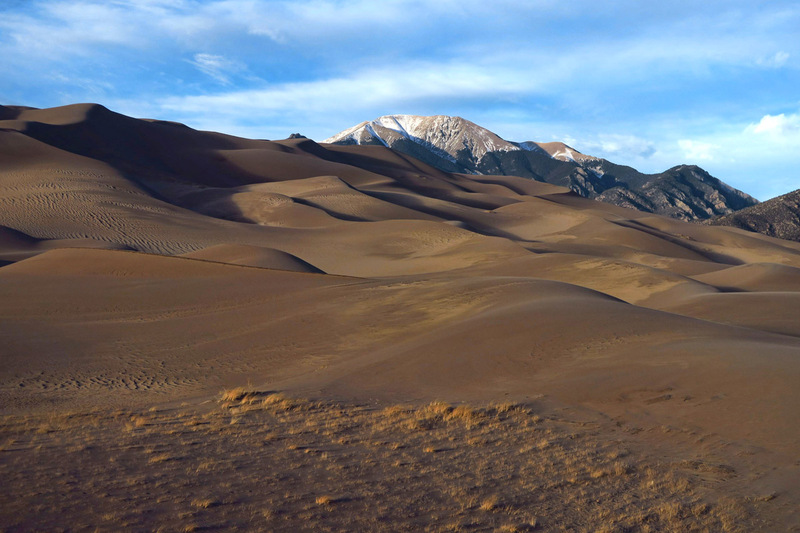 Great Sand Dunes National Park is my last NP on the western side of the Lower 48 left to cross off my list. I know mid-December is not exactly visiting at the ideal time, but it’s just about 30 miles out of the way of my direct path home for the holidaze. So after a few days in one of my favorite US towns flowing with an eternal abundance of soothing, rejuvenating, cleansing hot water, Pagosa Springs, I set my sights on one last bucket list item for 2016. Given the situation mentioned above where there is no camping near the national park, I research options that are still open this late in the year that will offer more than a plug on the post. Prices in the area are high, even in those locations that offer a dry camping option. It’s tough for me to pony up twenty bucks for nothing more than a parking place in a gravel parking lot, particularly in the wide open spaces such as the San Luis Valley. But then, I stumble across the quirky “Sand Dunes Swimming Pool and Campground” 30 miles away. 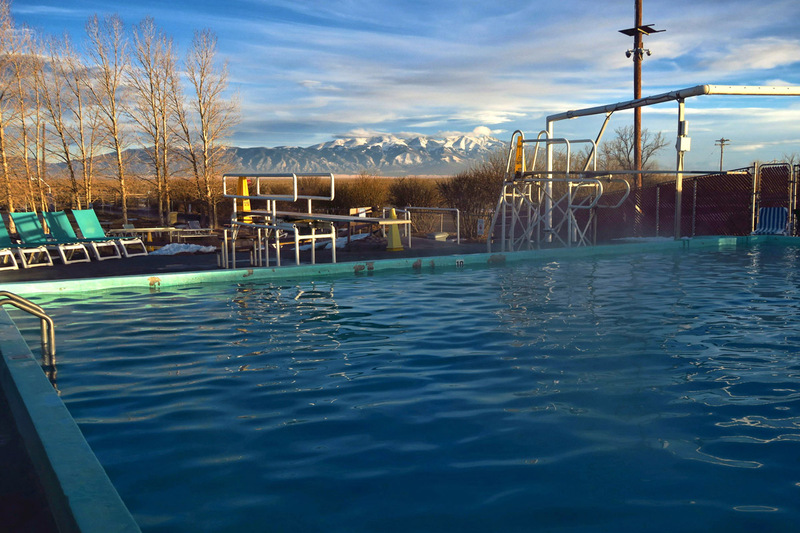 It would still cost me $20 to dry camp, but it includes half off admission to the giant spring-fed 99-degree swimming pool, complete with view of the snow capped Sangre de Cristos mountains as a scenic backdrop, visible through the rising steam off the hot springs. There is also a restaurant onsite, a plus considering the remote location and my limited cooking abilities following winterization. Giant, steamy 99 degree geothermal pool at Sand Dunes Swimming Pool and Campground. 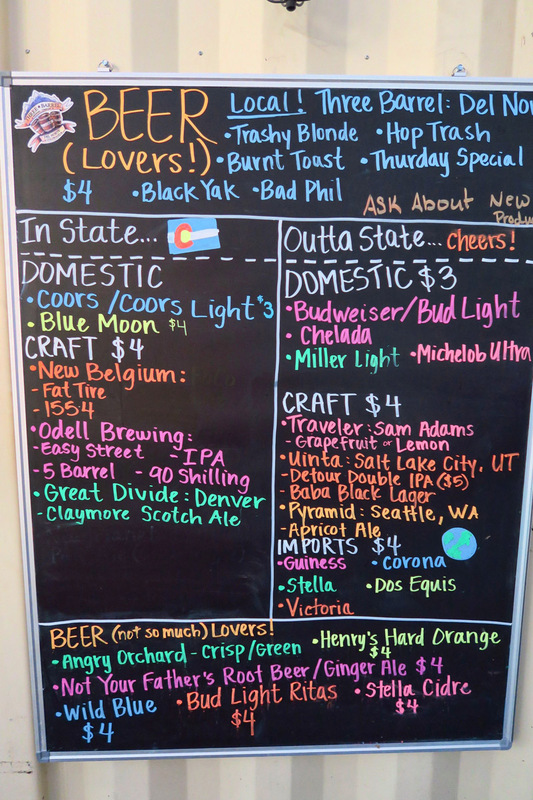 A decent beer selection for the middle of nowhere. 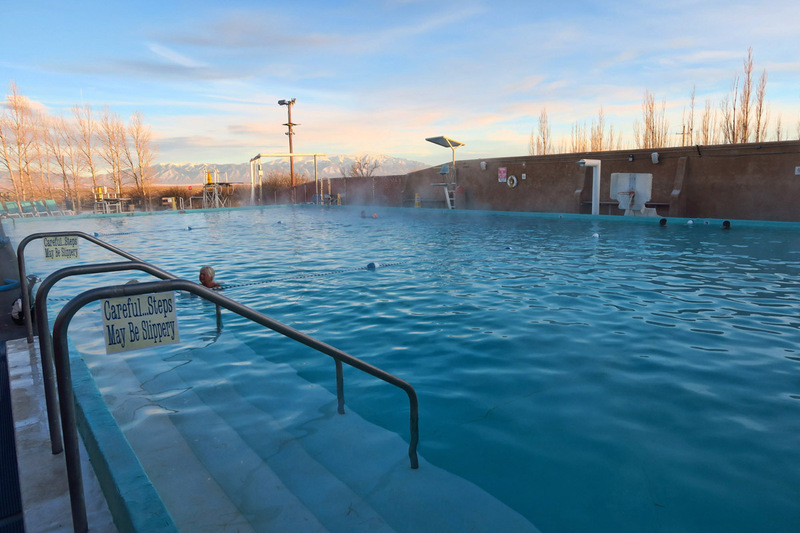 Swimming in the big pool offers a nice view of the Sangre de Cristos mountains. 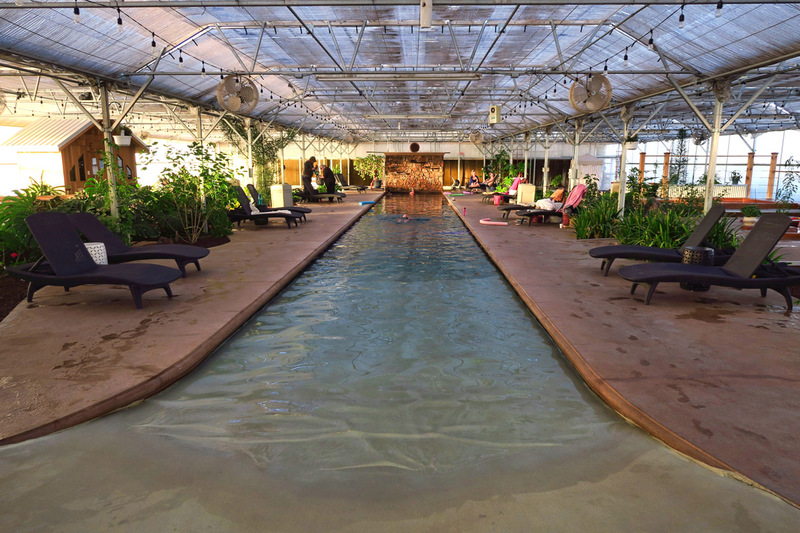 I pay the extra $3 for admission to “The Greenhouse,” a 21 and older section of the hot springs. The tropical garden filled with pools of varying degrees has a bar offering a surprising variety of libations for such a remote location. It’s a great venue if you don’t think about it too much. But it’s a 50 yard walk down a long, cold, tunnel to reach the greenhouse, which has no toilets. That means a long walk back to the main building when nature calls. Looking around me at all the people soaking in the warm springs, some of them surrounded by multiple empty beer cans, I start to observe how many actually get out of the water during the hour or so I am soaking. ..a sobering realization as I make an early exit for the showers. 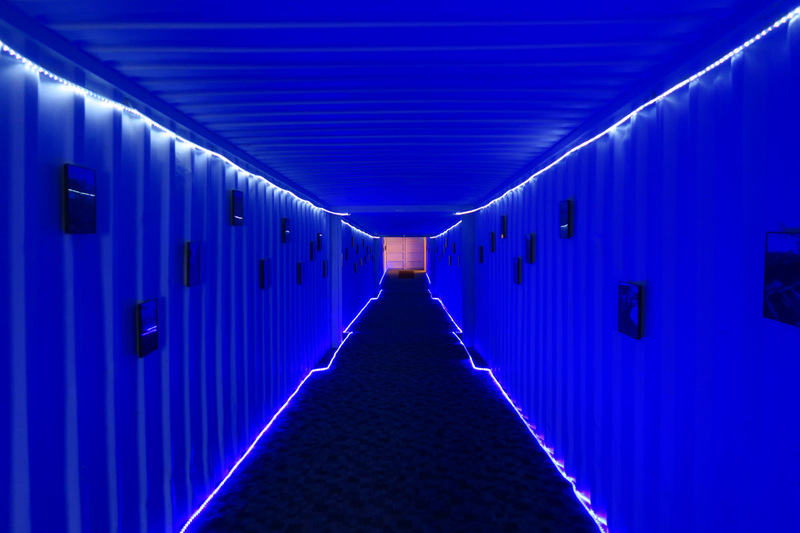 The long, cold, neon blue hallway from the main building to the Greenhouse. 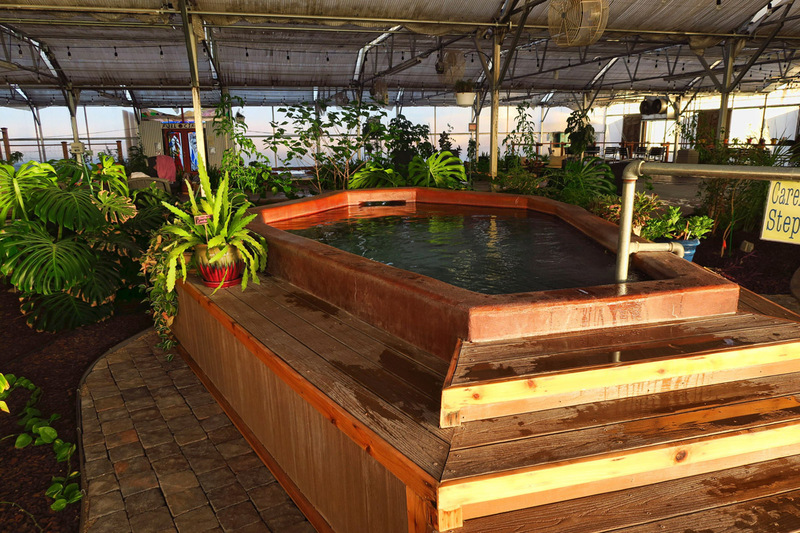 Lots of options for soaking in the Greenhouse, including this “Zero entry pool” which enables you to just walk in, increasing in depth as you walk. The hottest of the pools is called “The Coffin” at 109 degrees…and yes, it’s shaped like a coffin! Granted, it’s a brutally cold, blustery day, but I have a hard time getting excited on my way to climb High Dune. On my way across the dry Medano Creek bed , a woman returning stops me to ask, “Do you have any goggles? If you are thinking of climbing, you are gonna need goggles. It’s like being sand-blasted up there, and you may not be able to see your way down.” I return back to the Winnie for the closest thing I have to goggles….my SCUBA mask….just in case. I put on my puffy down jacket and wrap my head in a scarf like a Moroccan Berber, and begin my climb. 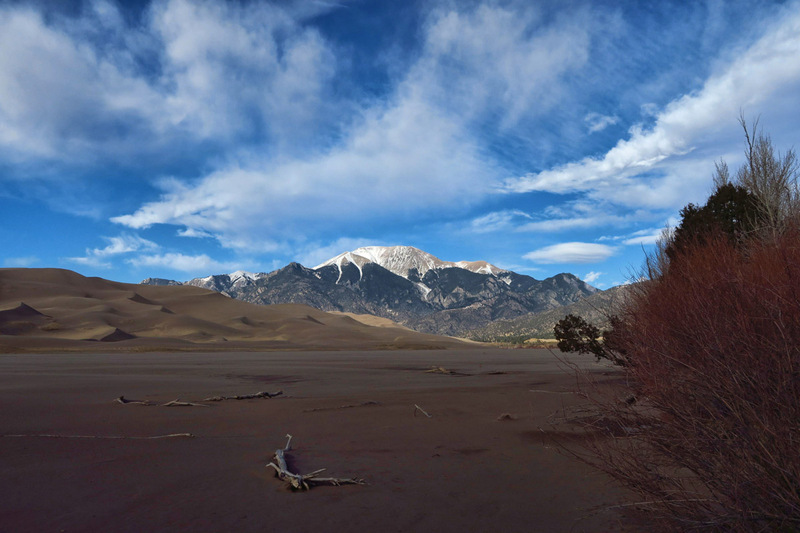 To access the dunes, one must cross the now dry Medano Creek, which only has water in early spring. 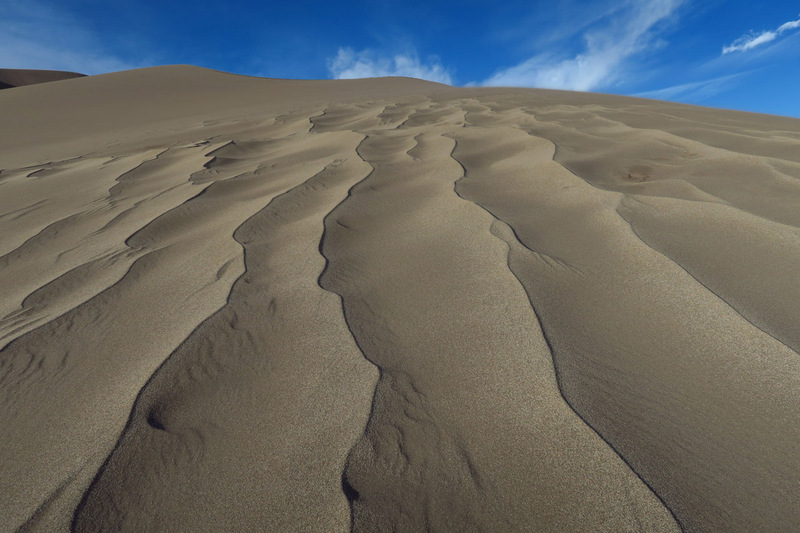 High Dune is over 750 ft high, the tallest sand dunes in North America. Notoriously high winds in this area contribute to the height of the dunes. 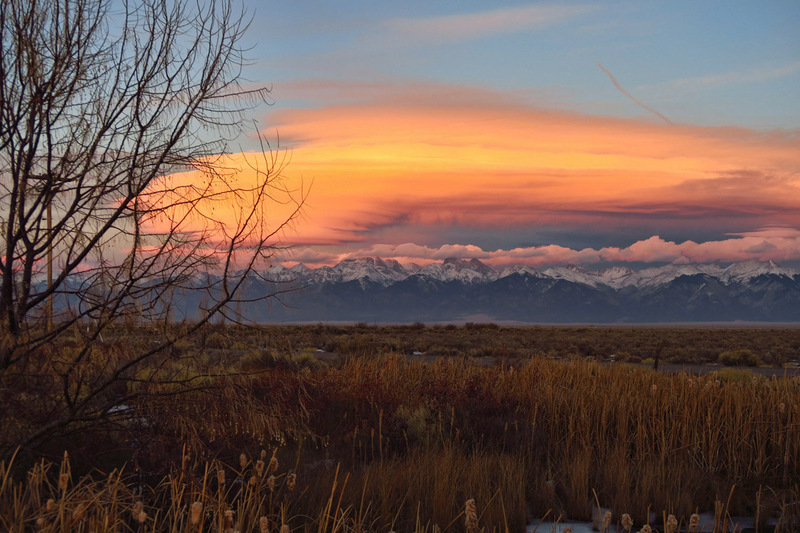 The park has been designated as the quietest of all national parks. 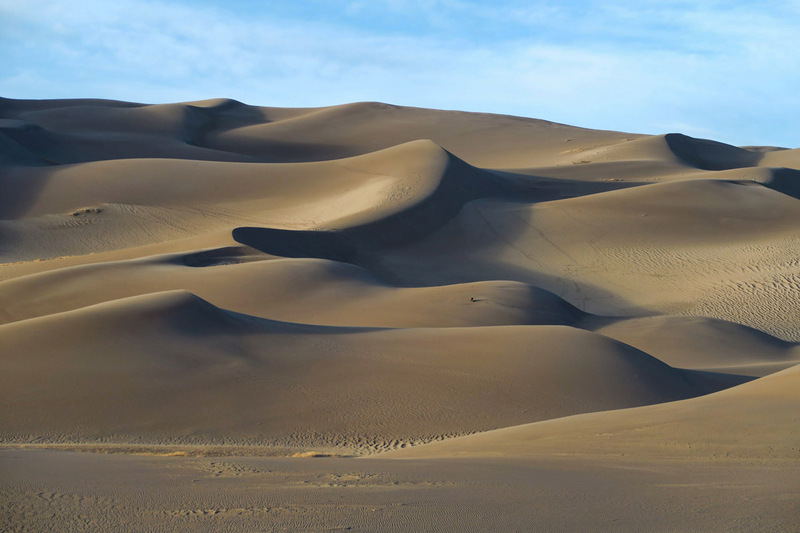 Note tiny “ants” just left of center…two people walking the dunes below gives size perspective. 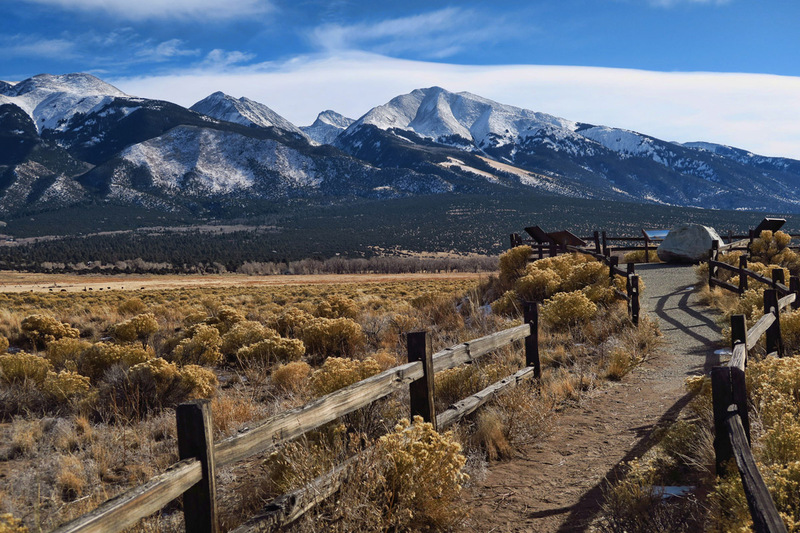 The park actually encompasses several 13,000 foot peaks, and borders on a couple of 14’ers. I am sorry to report of the National Parks with official “Park” status that I have visited thus far, this was one of my least favorites, second from the bottom to Pinnacles National Park. 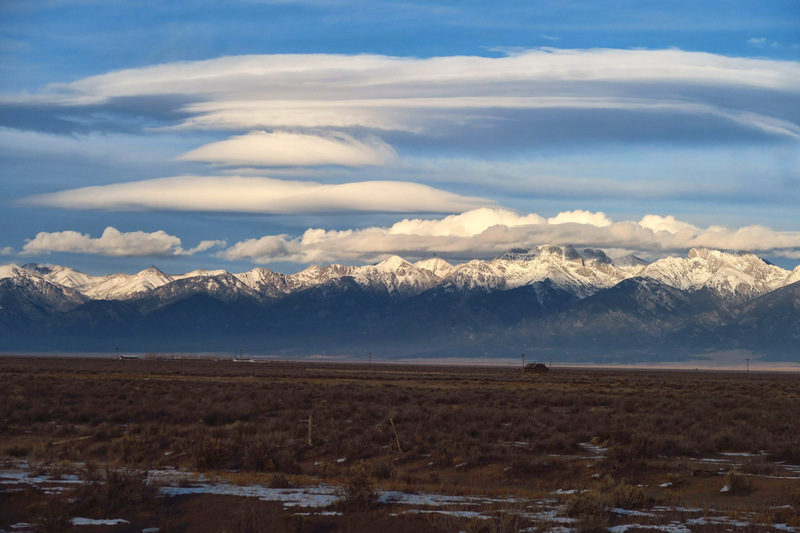 I would blame it on the time of year, were it not for the fact that the beautiful snow on the distant Sangre de Cristos mountains was the highlight. I think what left me cold (pun intended) was the dismal brown color of the sand. 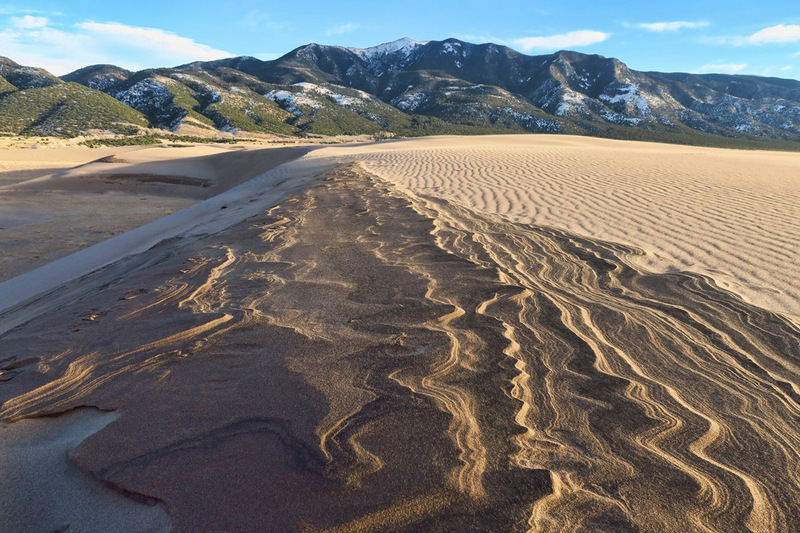 Great Sand Dunes is a relatatively new national park, being promoted from “Monument” to “Park” status in 2000 by President Bill Clinton during the purchase of nearby Baca Ranch, which doubled its size and encompassed the 14ers. 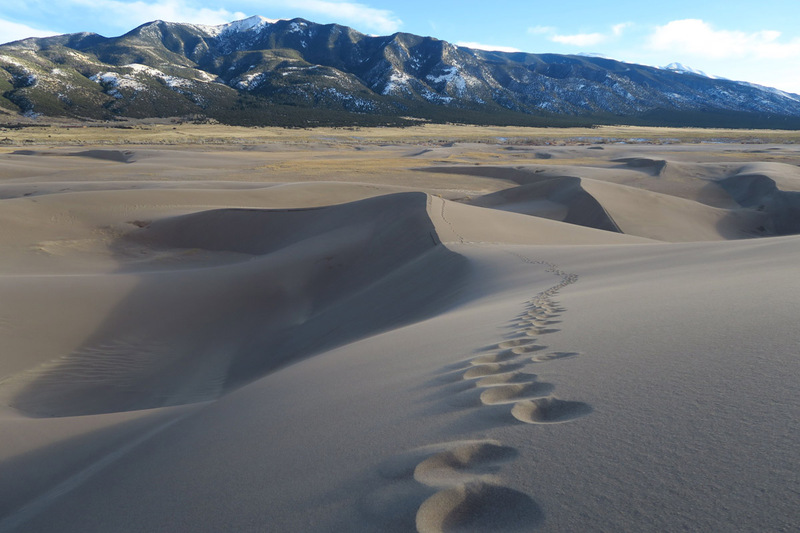 This entry was posted in Colorado, National Parks and tagged Great Sand Dunes National Park, Sand Dunes Swimming Pool and Campground by Suzanne. Bookmark the permalink. I’ve went to GSD Park years ago with family. We hiked down from a deserted lot above the dunes. I was in summer and there was a small creek flowing across the foot of the dunes. 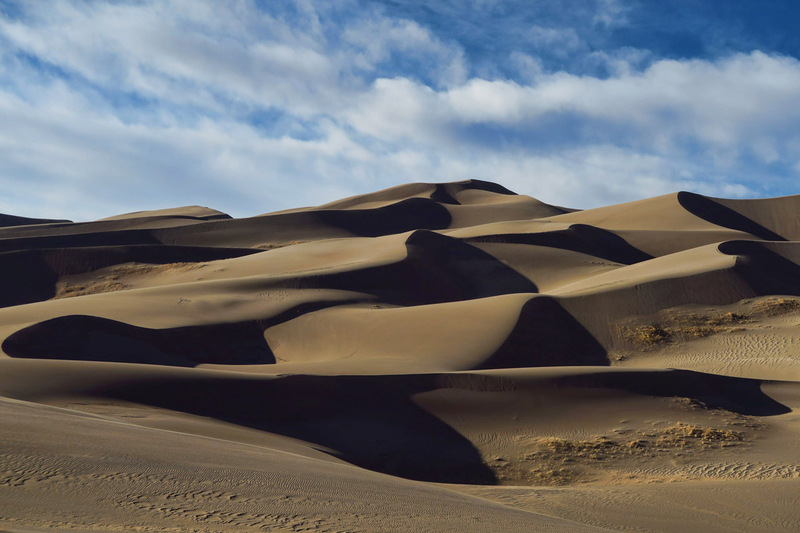 I lived near Oceano Dunes in California growing up and they were fantastic. However, the thing I like about GSD is the contrast between the Sangres and the dunes. They don’t seem to belong together. The dunes seem to have erupted from nowhere. It’s the incongruousness. Still winter is a booger. My favorite part of your post was the hot springs campground. I’m always on the lookout for out of the way hot springs and I didn’t know about this one. Thank you!!! Betty, that was probably Medrano Creek. You were fortunate to see it flowing, as it only flows a short time of the year, as I understand. Glad to know another hot springs fan! Beautiful overnight spot:) We find sand dunes very pretty from the car:) Hiking in deep sand just doesn’t cut it for us. I must say that your photos are gorgeous. I find the taupe color pretty in it own way. But then the photos always seem better than the actual dunes. I was very disappointed in White Sands. The photos show miles of fluffy pristine white sand. I found the sand lacking in pure white but rather dull white with spots of drying dead looking bushes all over. Our photos look much better than what we actually experienced in person. I guess I built it up too much in my mind. Definitely wouldn’t return. I enjoyed Coral Pin and Death Valley much better. Your did a great job with the photos, Suzanne:) And, of course, your narrative is always amusing:) Love, love that hot spring pool…wow! Pam, now you’ve got me worried that my memory of White Sand Dunes has “improved with age.” haha!! I remember it to be downright dreamy, so I will be sure to level-set expectations before I return. I was really bummed that I didn’t get to camp on the dunes during the full moon (I was working then, and full moon was mid-week, so I couldn’t stay.) So I hope to return to do that one day. I really appreciate the nice comments about the photos! Glad to see you working your way west! 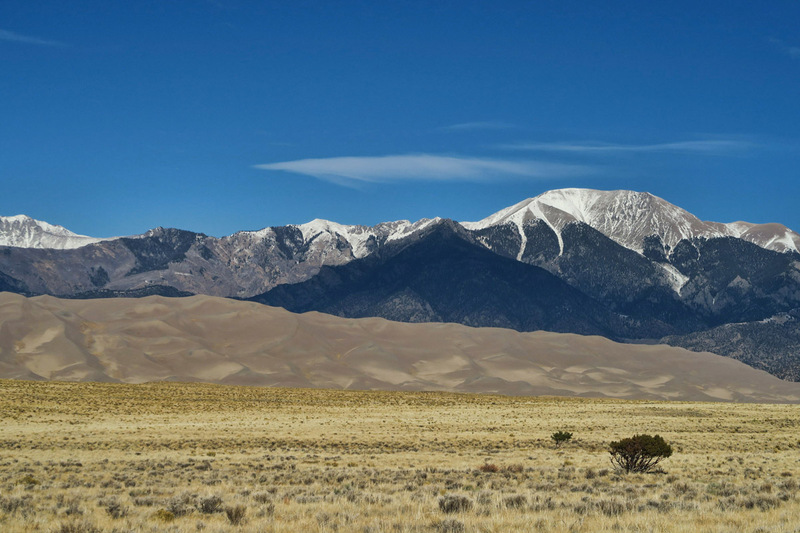 Despite the fact that it ranks second-to-last in your NP rankings, Great Sand Dunes NP looks stunningly beautiful. (Then again, we really enjoyed Pinnacles NP, both the hiking and the campground.) That hot springs campground is a great find! Hi, Laurel, thanks for the comment. I didn’t mean to imply that I did not enjoy the hikes at Pinnacles. The two I did were very scenic and rewarding. It is just my opinion that there’s not enough there to warrant being one of the 59 “premier jewels” in the NPS 417-jewel crown. Hope Eric continues to feel better and stronger! You missed the selfie of you bundled up with the scuba mask. No only kidding, your photos are beautiful. I will have to say that had you gone when the creek was running and did a presunrise ascent of the dunes, then on the way back cool off in the creek you would have liked it WAY better. The problem in the warmer months is that sand gets REALLY hot and you better be off the sand before it does. 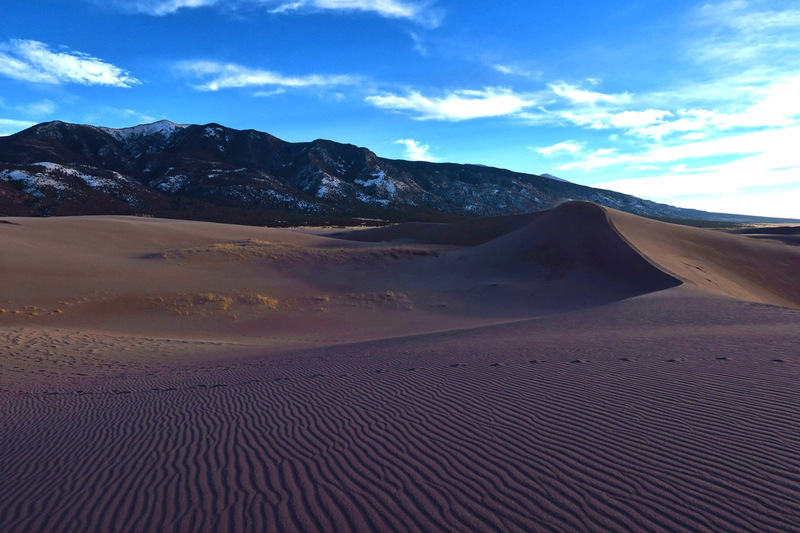 The campground is also pretty nice (been there several times as we live just East of Albuquerque) so it is too bad that you did not get to camp closer so you could enjoy a sunset or sunrise looking at the dunes. There are also some really nice hikes in the area. We did one South of the park entrance one year and went all the way up to the mountain pass……it was really nice. If you ever go back you should check out some of the hiking in the mountains near the park. Totally awesome set of pics…and from a place we’ve never been! It’s on our list now for sure. You did get some beautiful shots for your effort! And, knocked another off the list! Wow! Love the looks of the hotsprings and the whole area ! I love hot springs and when I get on my RV journey will stop at any I can find. Congratulations on completing the last western NP in the lower 48. That’s a lot of NP. I LOVE the hot spring RV park, and the blue tunnel. Regardless of your overall perspective, you took some beautiful pictures there! Glad to know you as well as others enjoyed it.